In 1974 1 was working for the Nuclear Services Corporation (NSC) as a systems application engi-neer when, through my studies of safety)s management, and reliability problems, I became aware of many engineering deficiencies in nuclear power systems that were already on the market. After a period of indecision about keeping this information to myself and not jeopardizing my career, I began to draft a paper critical of the commercial nuclear industry. On March 12, 1974, I presented this paper to a U.S. Senate subcommittee. Three weeks later, I was fired from my job. Peter Faulkner blew the whistle because he knew that standing idly by would have been wrong. Because reports to his supervisors were repeatedly ignored, public disclosure was his only option. Although his actions were in the public interest and performed in good faith, he was never able to appeal his termination and has been blacklisted from the nuclear engineering profession ever since. Many of his criticisms were later confirmed by failures at Dresden 1, Humboldt Bay, Indian Point 1, and Three Mile Island. The federal government had two options for bringing justice to whistleblowers in the nuclear industry: (1) whistleblower protection for all employees or (2) a piece-meal, stop-gap measure that covers only immediate crisis areas. The federal government, which has historically been reluctant to provide broad whistleblower protection, chose the stop-gap approach. Four years after Mr. Faulkner's testimony, Congress added an anti-retaliation provision to the laws which regulate the nuclear industry.2 Now, those who report violations of or testify in proceedings under these laws are protected from discrimination or termination. But, those who blow the whistle on other matters of public importance are still not protected. To date only 60 statutes among the thousands of federal statutes contain anti-retaliation provisions, and only two of those 60 statutes contain truly comprehensive anti-retaliation provisions. Employees should not have to choose between voicing their concerns over employer misconduct and keeping their jobs. More specifically, an employer's power to hire and fire employees at will should not be used to undermine the law or to compromise the safety and health of employees or the public. Blowing the whistle in order to correct wasteful, fraudulent, or abusive government practices should also be protected, as should reporting or attempting to correct unethical employer practices. From a civil liberties perspective, whistleblower protection is part and parcel of the broader notion of freedom of expression. The First Amendment, unfortunately, only limits the coercive powers of the Government, not private employers, whose employees are consequently forced to look to statutory law for protection. In the context of employment relations, the employer's interest in maintaining authority must be bal-anced with the employee's interest in freedom of speech .3 Although the conditions of the perfect balance are difficult to specify, any just arrangement should at the very least protect whistleblowers from retaliation. For the majority of Americans, the few laws that protect whistleblowers are inconsis-tent, scattered, and limited. Due to the bizarre and inconsistent nature of employment law, employers can and do fire employees for blowing the whistle. Although govern-ment employees have some legal recourse, protections are often incomplete and unsub-stantial. Private sector employees generally have no recourse. Many federal and state courts recognize certain narrow exceptions to the doctrine of employment-at-will. In some cases, these exceptions can be used to protect whistle-blowers. In addition, anti-retaliation clauses in a small set of environmental protection laws and employment laws also protect whistleblowers; employers cannot legally retaliate against employees who report violations of these laws or who provide testimony under these laws. Government employees are protected by the Constitution and, in some cases, statutory law, and private sector whistleblowers are protected in certain states. However, none of these laws amount to truly comprehensive whistleblower protection.7 Court protections are too limited and often unpredictable. Very few laws include anti--retaliation provisions, and those that do generally do not cover attempts at correcting violations of the law. Statutory whistleblower protections are usually unsubstantial, and only a handful provide protection for reports of unethical practices or safety hazards. In addition, few of these laws cover private sector employees. Finally, Constitutional protections for public sector employees are very limited and are often pre-empted by inadequate federal or state laws. Without protection, employees who decide to speak up will continue to face termina-tion, demotion, harassment, and blacklisting. Honest adherence to principles such as the freedom of expression or the rule of law demands protection for whistleblowers, and understanding the benefits whistleblowers provide society only further demon-strates the need for protection. It is time we realize that employers should not be allowed to use their position of power in an unjust manner. The first step in achieving such a goal is the enactment of comprehensive whistleblower protection laws. Although there are numerous laws which address whistleblowing, few of them are suffi-ciently comprehensive. In developing new whistleblower protection laws, it is of the utmost importance to understand where current legal protections fall short. The Supreme Court has determined that the Constitution protects government employee speech only on matters of "public concern." The Constitution does not provide any protection to private sector whistleblowers. Certain federal laws include anti-retaliation provisions which can be used to protect whistleblowers. However, the majority of laws do not include such pro-visions. Those that do tend to cover a very limited range of whistleblowing activities. Only 16 states provide statutory protection for private sector whistleblowers, and most of these statutes cover a very narrow range of whistleblowing activi-ties. Forty states provide statutory protection for public sector whistleblowers. However, these laws tend to cover a very narrow range of whistleblowing activi-ties. In most jurisdictions, the common law public policy exception only provides protection for a very narrow class of whistleblower activities. The exception, in most jurisdictions, can only be invoked in cases where employer misconduct is explicitly illegal under statutory law. Generally, the public policy exception is a last resort for an already discharged whistleblower seeking relief. Unionized employees may seek protection under their collective bargaining contracts. Arbitrators may, however, view whistleblowing as disloyalty, for which employee dismissal is permissible. The Constitution regulates government action, not employer action. In situations where the government acts as an employer, the Constitution does apply in a limited manner. As a result, although there is no general freedom of speech protection for all employees, public employees are protected for certain types of expression. The Constitution offers no protection for private sector employees. In Pickering v Board of Education,8 the Court began to define the type of public employee speech protected by the Constitution. The plaintiff, a public school teacher, was fired for publicly criticizing the school board's budgetary decisions. The Court held that a public employer's interest in controlling employee speech must be balanced with a public employee's First Amendment rights. Given the importance of "free and unhindered" political speech, the Court determined that speech on matters of "public concern" must be protected, whereas all other speech could legitimately be controlled by the employer. The judicial doctrine of employment-at-will forms the foundation of modern employ-ment law. In theory, the doctrine allows employers and employees to regulate the terms of employment through contract. In practice, however, the doctrine lets employers, who are generally in a position of economic power over their employees, unilaterally set the terms of employment; as a result, employers can discharge employees at any time and for any reason, good or bad.14 Unlike statutory laws, employment-at-will was delineated by the courts, in a body of law know as common law. Most jurisdictions require employees seeking protection to show that their employers violated specific statutory laws, that adverse treatment was due to reporting these viola-tions, and that the statutes condone or encourage employee reports of transgressions. Most jurisdictions narrowly construe the last of these requirements. For example, an employee would be protected from discharge for refusing to participate in price fixing schemes, since such schemes are illegal.17 But an employee would not be protected from discharge for disclosing information about an employer's engaging in price fixing schemes, since anti-trust and tax laws do not explicitly require or empower employees to report employer infractions.18 In other, more protective jurisdictions, legislative poli-cy need not be as explicit. In Harless v First National Bank,19 an employee was fired for attempting to correct the bank's violations of a consumer credit law. Although the law did not explicitly require employees to correct violations, the court ruled that the legis-lature, in passing the law, intended to create a public policy and that such a policy should not be hindered by the doctrine of employment-at-will. Under collective bargaining agreements, disloyalty to an employer can constitute grounds for dismissal, and whistleblowing is often construed as disloyalty. In Davenport Good Samaritan Center,21 a dietary aide was discharged for reporting her employer, a nursing home, to state health officials. The aide filed her report after she had shown her supervisor that a loaf of bread had been partially eaten by rodents, and the supervisor had ordered her to remove the eaten portion and serve the rest to patients. The arbitrator upheld the dismissal due to the damage caused to the nursing home's reputation as a result of the filing. The arbitrator held that although the aide had approached her supervisor, she should have gone to the administrator of the home before reporting to the state. Similarly, in R.P. Richards, Inc.,22 a plumbing contractor had petitioned a public agen-cy for permission to substitute plastic pipe for cast iron pipe in a construction project. In a public hearing, one of the contractor's employees, who specifically stated that he was speaking as a private citizen, testified against the substitution. As a result, the employee was discharged. The arbitrator upheld the discharge, citing damage to the employer's reputation and the fact that the press had linked the employee publicly with the contractor. In other cases, arbitrators have sided with employees. However, their lack of consisten-cy indicates that even unionized employees are not wholly protected from retaliation for blowing the whistle. Most federal employees23 can challenge retaliation for whistleblowing through the Civil Service Reform Act of 1978(CSRA),24 which not only provides protection for whistle-blowers but also creates a just cause standard for the dismissal of most federal employ-ees. The CSRA, however, has a number of problems. Prior to its amendment, employees had to show that their whistleblowing was the primary reason for their dismissal. This proved to be too great a burden of proof. Also, employees were only protected in cases where they were fired; harassment was not covered by the Act. Finally, CSRA did not provide the right to challenge retaliation through civil action. Federal employees had to file with the Office of Special Counsel, the agency charged with administering the CSRA. Due to the Office's vested interest in protecting government agencies, whistle-blowers were often ignored. The Whistleblower Protection Act of 198925 amends the CSRA and attempts to correct these problems. An employee now need only show that whistleblowing contributed to his or her discharge, while the agency against which a charge is filed must establish clear and convincing evidence that it had a good reason for the termination. Hence, after an employee establishes that whistleblowing activity contributed to the discharge, the bur-den of proof shifts to the employer, who must show that discharge occurred for reasons besides the employees blowing the whistle. Finally, employees have the right to appeal their case to the Merit Systems Protection Board. A limited number of federal and state laws include provisions which prohibit retaliation against those who participate in hearings, investigations, inquires, court actions, and other procedures to enforce these particular laws. These anti-retaliation prohibitions are intended to encourage compliance with the particular laws and are most often found in employment, environmental protection, safety and health, and transportation statutes. However, protection for whistleblowers whose actions fall under a law that includes an anti-retaliation provision remains too limited, and the degree of protection provided differs from law to law. Title VII of the Civil Rights Act of 196428 and the Age Discrimination in Employment Act29 provide the broadest federal anti-retaliation protections. Under these laws an employer is not allowed to retaliate against employees for participating in proceedings under either law or for opposing employer practices which they believe violate either law. Retaliation is broadly defined to include all actions outside the employer's usual procedures. Also, a prospective employer may not consider a candidate's prior assertion of rights under either law in making hiring decisions. The primary problem with such piece-meal protections are that the standard of protec-tion differs from act to act and not all laws are covered since only a handful include anti-retaliation provisions. The term "whistleblowing" is used to describe acts of alerting the public or the govern-ment of misconduct (specifically employer misconduct) such as violations of the law, threats to the safety and health of the public or co-workers, and breaches of well-accept-ed standards of professional ethics. "Whistleblowing" was originally used to describe English police officers ("bobbies") blowing their whistles to alert the public and other police officers of danger or crime. What about loyalty to the company? Certainly, employers need to demand a certain degree of personal loyalty from their employees. However, loyalty to the law, concern for the safety and health of the public and co-workers, and adherence to basic standards of professional ethics must come before loyalty to the company. From another perspective, loyalty to the law is an inte-gral part of loyalty to the company. Wouldn't a whistleblower protection act encourage frivolous filings? No. 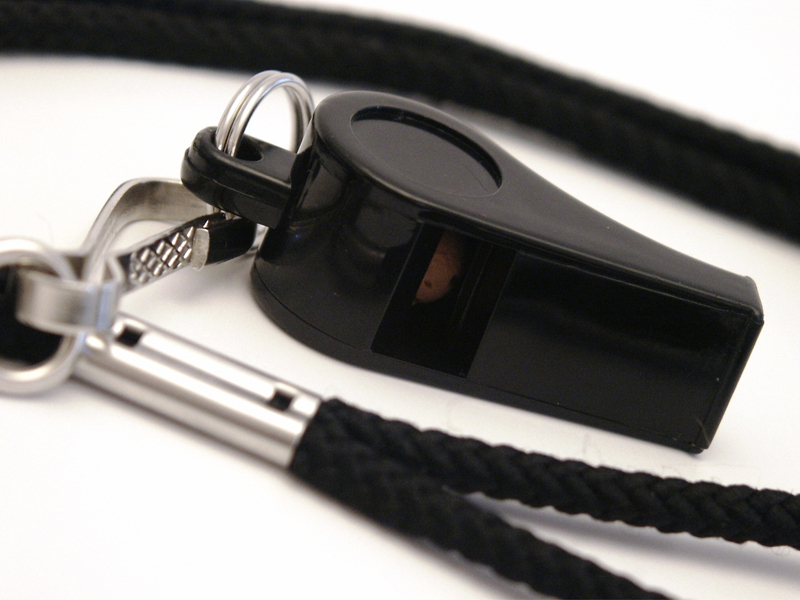 The stress and social ostracism resulting from blowing the whistle tend to prevent frivolous filings. In addition, according to the federal rules of civil procedure, lawyers may be penalized for frivolous filings, thereby encouraging them not to pursue whistle-blowing claims unless they are convinced of their merit. Similar rules exist at the state level. Furthermore, contrary to popular belief, people do not file lawsuits on a whim; the high cost of retaining an attorney is more than sufficient to prevent frivolous claims. Are whistleblowers protected by the Constitution? No. The Constitution offers no protection for private sector employees. They must look to federal and state law for security. Public sector employees are protected only for political speech. Are whistleblowers protected by state or federal law? Usually not.41 Federal and state laws that protect whistleblowers are paltry, scattered, limited, and inconsistent. Although protections are generally poor, public sector employees, in part due to constitutional safeguards, are better protected than private sector employees. All employees who report violations of laws which contain anti-retaliation provisions are protected. Such provisions are found in only a small but important set of federal and state laws regulating environmental pollution, public and workplace safety and health, and employment relations. Protected disclosures are generally limited to reports of violations. Attempts at correcting an employer's illegal conduct are generally not covered. In addition, the burden of proof requirements in most anti-retaliation provi-sions make it virtually impossible for the employee to prove illegal retaliation. Federal employees who blow the whistle can challenge retaliation through the Civil Service Reform Act (CSRA). State employees can challenge retaliation through similar laws in a number of states. As discussed above, in those states where similar laws do not exist, state employees who have been retaliated against for speech on matters of "public concern" may seek relief through civil action charging a violation of their freedom of speech. Oddly enough, state employees in states without whistleblower protection laws may in effect have more protection than state employees in states where such laws exist. The flaws in the CSRA explain this paradox. The CSRA, even after amendment by the Whistleblower Protection Act of 1989, does not adequately secure the rights of public sector whistleblowers. Due to a variety of factors including mismanagement, procedures for seeking relief do not in practice serve to protect public sector whistleblowers. Although the courts recognize limited free-dom of speech rights for public sector employees, they does not allow these employees to pursue remedies through civil action when a statutory scheme for protection exists. As noted by organizations such as the Government Accountability Project, the CSRA gives federal employees a false sense of protection. As amended by the Whistleblower Protection Act of 1989, the CSRA provides the strongest freedom of speech rights in existence for federal employees. However, these rights, although recognized on paper, have not been fulfilled in practice. In a 1993 survey, the Merit Systems Protection Board found that since 1983 the rate of retaliation against federal employees who blow the whistle increased from 24% to 37%. "Less than 10% [of those employees] exercis-ing legal remedies were helped, and 45% report that acting on their rights got them in more trouble. The Board found that, by a 60-23 margin, employees do not believe that their rights will help them, and fear of reprisal remains a strong reason why would-be whistleblowers stay silent as in 1983." The primary reason for the CSRA's practical fail-ure to protect whistleblowers is still the Office of the Special Counsel, which has a histo-ry of obtaining relief for only 5% of those who file complains. Of those turned away, 35% found help elsewhere. State employees covered by similarly inadequate statutory schemes are in the same position as their federal counterparts. What is a fair burden of proof arrangement? Most whistleblower protection laws require employees to show by a preponderance of evidence that protected speech was the predominant, motivating factor for alleged harassment. Even then, an employer wins by demonstrating that it would have taken the same action for independent reasons in the absence of whistleblowing. In most cases, this standard makes it impossible for the whistleblower to win, since the employ-er merely needs to claim that the employee was justifiably discharged or justifiably treat-ed adversely for some other reason, such as poor performance. The employee is twice faced with the burden of reading the employer's mind, which is virtually impossible in the absence of a confession. A preferable standard offers whistleblowers a more realistic burden. Once employees show, by a preponderance of evidence, that whistleblowing activities contributed to their mistreatment, the burden of proof should shift to the employer to show by clear and convincing evidence that the termination would have taken place for reasons besides the employee's blowing the whistle. This burden of proof better ensures that the whistleblower who was fired for blowing the whistle has a fair chance of winning in a legal proceeding. What is the scope of adequate whistleblower protection? In order for a whistleblower protection law to deter employer misconduct, employees must be protected from retaliation for public disclosure of misconduct, for refusing to participate in misconduct, and for exercising their statutory rights. These measures together constitute comprehensive protection. Anything weaker prevents adequate deterrence against retaliation. Aren't hazards to the safety and health of co-workers or the public already covered under the Occupational Safety and Health Act? In some cases, safety and health hazards are covered by the Occupational Safety and Health Act (OSHA). Section 11 (c) of the Act was written to provide protection for workers who blow the whistle on dangerous workplace conditions. However, whistle-blowers are only protected for making formal reports of violations to OSHA adminis-trators. Many potential dangers (for example, uses of the vast majority of toxic sub-stances) are not covered by OSHA at all.43 Under current laws, workers who seek to complain about such hazards, or about any hazards to groups other than OSHA may still face retaliation. And for those who do choose to file directly to OSHA, numerous studies have found that the agency fails to follow up on complaints, discourages employees from seeking compensation, and in general acts as "an adversary, not an advocate" to workers.44 This is in part due to the fact that the Act does not provide complainants with due process rights. Consequently, there is no guarantee of a response, since the administrators are not obliged to respond. For those complaints that the OSHA administrators deign to review, decisions take three to five years. While the Act is a source of protection for whistleblowers on paper, it is far from reli-able in practice. BROAD COVERAGE - Current, past, and prospective employees are all protected from retaliation for blowing the whistle, demonstrating intent to blow the whistle, assisting others in blowing the whistle, or engaging in actions to assist in carrying out the purposes of the law. PROTECTED DISCLOSURES include reporting safety hazards, violations of the law, and violations of well recognized codes of professional ethics. Reports of government malfeasance are also protected. PROTECTED ACTIVITIES include making protected disclosures, refusing to violate the law, refusing to violate well recognized codes of professional ethics, refusing to work in hazardous conditions, and refusing to participate in government malfeasance; assist-ing in achieving compliance with the law; assisting in creating safe work conditions; and refusing to reveal or ordering others to reveal the contents of a protected disclosure. REMEDIES include reinstatement; compensation for lost pay, benefits, and seniority status; interest on lost pay; reasonable costs; and (where appropriate) damages and civil fines. STATUTE OF LIMITATIONS - Employees may file under this Act up to two years after the violation or up to two years after he or she becomes aware of the violation. COMPLAINT PROCEDURE - Employees have the option of pursuing civil action or filing a complaint with the state's Secretary of Labor. BURDEN OF PROOF - Once it is shown that an employee's report of misconduct is a contributing factor in a discharge, demotion, loss of pay, loss of benefits, or any other alleged discriminatory action, the employer must prove by clear and convincing evi-dence that the action would have occurred for lawful reasons independent of the employee's blowing the whistle. Prohibited personnel action shall include but not be limited to termination, threats, referral to psychiatric or psychological counseling or examination and the maintenance of records or reports referring to such counseling or exami-nation, blacklisting, withholding (or threatening to withhold) a favorable personnel action, or in any other manner discriminating against an employee or attempting to interfere with the release of a protected disclosure or exercise of a right under federal, state, or local law, rule, or regulation. any other action to assist in carrying out the purposes of federal, state, or local law, rule, or regulation, including this Act. The term "employee" shall broadly cover any person who has been in the ser-vice of another, is in the service of another, or is applying to be in the service of another whether or not specifically under the direct control of the other, under any contract of hire, expressed or implied, including but not limited to at will employees, contract employees, and independent contractors. The term "employer" shall mean any individual, partnership, association, agency, or corporation, or any person or group of persons acting as an agent of the employer, including agencies of the state and its political subdivisions. to conduct or order others to conduct acts which may pose a significant threat to employee or public health or safety. standards which insure against significant threats to employees or the public. refusing to reveal, refusing to order others to reveal, or assisting others in refusing to reveal the contents of a protected disclosure to the employer. Upon a violation of any the provisions of Sec. 1, an aggrieved former, current, or prospective employee may either i)	bring a civil action in a court of competent jurisdiction; or ii)	file complaints with the state's Secretary of Labor pursuant to Sec 3(c). Statute of Limitation - Civil actions or complaints must be filed up to either two years after a violation of Sec. 2 occurs or two years after the employee first becomes aware that a violation of Sec. 2 has occurred. Employer Notification - Upon receipt of a complaint under Sec. 3(a)(ii), an employer must be notified of the filing of the complaint. Filings -Within 30 days of receipt, the Secretary shall investigate and issue a preliminary report as to whether there is reasonable cause to believe that the complaint has merit. The preliminary report shall include a finding of fact. If reasonable cause is found, the Secretary shall provide injunctive relief pending final order. Hearing Before an Administrative Law Judge under Sec. 3(a)(ii) - Both par-ties have the right to a hearing de novo before an administrative law judge of the state's department of Labor if either party chooses to appeal the Secretary's report or if the report has not been issued within 30 days of filing the complaint, as required by Sec. 3(d). Appeals against the Secretary's report must be filed within 30 of days its issuance. The administrative law judge must issue a decision within 60 days of filing. If the administrative law judge fails to make a decision within that time, the employee may file a civil action within 180 days for remedies in any state court of competent jurisdiction, and the employer may file to have the Secretary's injunction removed. Final Order under Sec. 3(a)(ii) -The Secretary shall issue a final order with-in 30 days of issuing a preliminary report or within 30 days of the adminis-trative law judge's issuance of a decision, whichever comes later. If the Secretary fails to issue a final order within 30 days of the administrative law judge's issuance of a decision, the administrative law judge's decision shall be enforceable as the Secretary's final order. Judicial Review under Sec. 3(a)(ii) - Within 60 days after the final order is issued by the Secretary or the court, either party may obtain review of the order in the state court of appeals for the jurisdiction in which the violation of Sec. 2 allegedly occurred. Pending review by a state court of appeals, the order shall not be subject to judicial review in a criminal or civil proceeding. In a civil action or in proceedings under Sec. 3(c), once it has been demonstrated by a preponderance of evidence that an activity protected by Sec. 2 was a contributing factor in the alleged prohibited personnel action against a former, current, or prospective employee, the burden of proof shall be on the employer to prove by clear and convinc-ing evidence that the alleged action would have occurred for legitimate, independent reasons even if the employee had not engaged in activities protected by Sec. 2. Affirmative action to correct violations includes but is not limited to reinstatement to former position, seniority status, lost benefits, back pay, interest on back pay, com-pensatory damages where appropriate, reasonable costs and attorney's fees, punitive damages, and injunction. Those who violate or attempt to violate this act shall be liable for a civil fine of up to $1000.00 for the first violation of this Act and up to $5000.00. An employer shall conspicuously display notice of the rights and obligations mandat-ed under this Act and shall use other appropriate means to keep employees so informed. The state's Secretary of Labor shall prescribe the content of part (a)'s notice. Comprehensive whistleblower protection legislation must combine an adequate scope of protection with an effective enforcement procedure. Current whistleblower protec-tion laws are lacking on several counts. The model act, although extremely ambitious, provides a measure against which to compare draft legislation. The scope of protection offered by whistleblower legislation is determined primarily by three factors: (1) which personnel practices are prohibited, (2) which disclosures are protected, and (3) which activities are protected. Factors two and three could be jointly thought of as a list of protected activities. Keeping the two factors separate, however, helps distinguish between expression and other forms of activity. The overall effective-ness of whistleblower protection legislation is determined by three primary factors: (1) the enforcement procedure, (2) the burden of proof arrangement, and (3) the remedies. A number of state laws contain explicit provisions to (1) prevent frivolous claims and (2) give employers a chance to rectify problems internally. Although such provisions are theoretically appealing, in practice they serve to weaken whistleblower protection laws. "Prohibited personnel action" must be defined in a broad, open-ended man-ner in order to prevent employers from discriminating against employees for blowing or threatening to blow the whistle. Any finite list of prohibited actions would leave room for more creative employers and their attorneys to devise ways to "deal" with whistleblowers. A typical method of punishing whistleblowers is to make their working lives miserable. This can include giving them more work than is humanly possi-ble to finish, or demoralizing them by requiring them to attend psychological counseling. For less scrupulous employers, specific lists of prohibited actions merely provide a check-list to work around. Legislators often complain that broad, open-ended statutory language fails to provide a clear mandate; they prefer narrow statutory language because it conveys a clear sense of do's and don'ts. Broadly defining prohibited person-nel action is an exception to this complaint. Employers have a clear man-date: discharge or demotion for poor performance is permissible, but retalia-tion against an employee for blowing the whistle is impermissible. "Protected disclosure," in the context of the model act, defines what employ-ee speech is protected. Almost all state whistleblower protection acts protect communication which discloses violations of the law. The model act, in addition, covers employee communications regarding safety hazards and vio-lations of professional codes of ethics. Public employees are further protected for communications regarding government malfeasance. The range of speech whistleblower protection legislation should secure is a function of principle and political feasibility. On principle, the employer's interest in controlling employee speech must be balanced with other concerns such as justice, the employee's interests, and societal interests. "Protected disclosure," as defined in the model act, covers a narrow set of topics, which most people would agree are directly connected to employee and social well-being. Also, only "good faith"45 communications are protect-ed by the model act.46 Intentionally false disclosures are not covered. Besides communications on the listed topics, the model act also covers a vari-ety of other activities. Most current whistleblower protection laws only cover disclosures and exclude other activities such as exercising a legal right or refusing to violate the law. However, there are certain whistleblower protec-tion laws that do include a broad list of activities besides speech. The model act conceives of "whistleblowing" as activities, not just speech, intended to correct, report, or prevent employer misconduct. In most cases, the listed activities are a simple extension of the protected top-ics of communication. As with the "protected disclosures," these activities must be secured. For example, if one should be allowed to make a disclosure concerning the violation of broadly recognized standards of professional ethics, it only makes sense that one should be further allowed to refuse orders to violate these standards. Who the employee is protected from is another important facet of practically protecting whistleblower activities. Most state whistleblower protection acts prevent retaliation by employers. In certain cases, depending on the statuto-ry definition of "employer," the employees of subcontractors or employees who work for employers other than their own may not be adequately pro-tected against retaliation, since the retaliating party may not be their "employer." The model statute avoids this difficulty by prohibiting any per-son from retaliating against another for making protected disclosures. Such a construction more effectively covers the usual as well as unusual employment situation. Section 3. of the model act provides a two-track system by which whistle-blowers may seek relief.47 Each track has advantages and disadvantages. Civil action will have a greater impact, while the administrative route will be quicker and less expensive for all parties. A statute with just one of these two tracks might result in less effective pro-tections for whistleblowers. The primary difficulty with civil action is the time it takes to get to court. Administrative procedures, although quicker, may not, in practice, have the same degree of procedural fairness as judicial proceedings. In addition, justice for the whistleblower becomes a function of department of labor politics and funding. A two- track system would allow whistleblowers to weigh the advantages and disadvantages of both tracks, and choose the one best suited to their case. Whistleblower protection laws cannot effectively protect employees without a fair burden of proof arrangement. Many of the current laws designed to pro-tect whistleblowers place the entire burden of proof on the employee. Employers typically claim that the employee was fired for some reason besides blowing the whistle. Few employees can mount enough evidence to counter such a claim. The model act introduces an alternative. Employees need only show that blowing the whistle contributed to their mistreatment, after which the employer must show the employee would have been fired independently of his or her blowing the whistle.48 Such a burden of proof sets up a more real-istic standard for employees. False claims will be shown to be false under either arrangement, while valid claims can be more easily proven in the courts. The remedies included in the model act are very similar to those in most state acts. Of course, narrower remedies would make whistleblower protec-tion legislation less effective. The deterrence factor for unscrupulous employers is largely a function of the remedies for employees. Many of the current state whistleblower protection statutes include provi-sions to penalize employees who file frivolous claims. Penalties may range from paying the employer's legal fees to paying a fine. The model act does not include such a provision because penalizing frivolous claims has a chilling effect on those with meritorious claims. For most employees the mere chance of having to pay their employer's legal fees is enough to keep them from filing complains. Frivolous claim clauses are also redundant. According to the federal rules of civil procedure, lawyers may be penalized for frivolous filings, thereby encouraging them not to pursue frivolous whistleblowing claims. Similar rules exist in most states. In order to be protected under a number of state whistleblower statutes, the employees must, prior to public disclosure, give their employers a chance to rectify problems. For example, employees must first report violations of the law to their employers. The employers have a certain period of time in which to address the employee's concerns. If the employer fails to address the employees concerns, the employee may make a public disclosure. In theory this procedure should work, but in practice it often serves to undermine the whistleblower. In situations where the employer can be trust-ed, the employee should inform the employer. In situations where the employer cannot be trusted, however, the employee should have other alter-natives. Employer notification requirements of this sort should not be legislated. Ideally, the whistleblower should be allowed to choose. Employers may encourage their employees to report misconduct to company officials, but this should not be legally sanctioned. Employer notification provisions may be a necessary compromise for passage of this legislation. In such cases, exceptions must be made for cases in which employees have a reasonable cause to expect retaliation or for cases in which employee disclosures are necessary for law enforcement functions. Most state whistleblower protection statutes in existence include poorly constructed employer notification provisions. It is very difficult to construct an employer notification provision that does not, in effect, stifle employees from engaging in legitimate whistleblowing. In addition, employer notification require-ments just give unscrupulous employers additional time to undercut whistle-blowers. For these reasons it is highly advisable to avoid including employer notification provisions altogether. Not all businesses oppose the adoption of whistleblower protection laws. Large busi-nesses and industry groups are generally opposed to whistleblower protection laws. They argue that such legislation unnecessarily regulates businesses, which are perfectly capable of cleaning their own houses. In addition, whistleblower protection legislation will inundate businesses with frivolous claims. The meat, poultry, and fish industries are likely to voice similar concerns. The response to such opposition is fairly clear. If companies sincerely want to clean their own houses, nothing in our model legislation would prevent them. They are still free to encourage employees to inform company officials of misconduct. The degree to which the model legislation interferes with a company's everyday routine depends on the degree to which a company is willing to abide by the law. In addition, states which protect whistleblowers have not experienced problems with frivolous claims. Filing a claim usually entails retaining an attorney, the cost of which should more than ade-quately deter false claims. Furthermore, whistleblowing is almost always a last resort for employees. So again, companies that diligently listen to their employees need not fear whistleblower protection legislation. Small business may be supportive of whistleblower protection legislation. As one com-mentator has said, "Whistleblower protection is one of the best safeguards against unfair competition in the private sector. "49 Small business are faced with a number of obstacles. Among these are a number of unfair practices by some of their larger, more powerful competitors. Whistleblower protection is crucial to ensuring fair competition. Organized labor; government watchdog groups; environmental protection groups; women's rights groups; professional ethics organizations; and professional societies for engineers; journalists, accountants, and auditors may all support whistleblower protec-tion.50 Organized labor can only benefit from broad whistleblower protection laws which provide protection over and above that found in collective bargaining contracts or the National Labor Relations Act. Similarly, environmental as well as women's rights organizations will see the value in broad legislation which can cover areas which the anti-retaliation provisions in most federal environmental and civil rights laws fail to cover. Finally, engineers, journalists, accountants, and auditors are likely to have heard of or to have been faced with reporting violations of the law or preventing violations of the law. They are therefore likely to understand the need for whistleblower protection. Whistleblower protection legislation is rarely passed proactively. Only after crises (like the contamination of Michigan's dairy supplies with carcinogens51 which could have been prevented had whistleblowers been assured of protection) are legislators motivated to act. Documenting and publicizing these crises is of the utmost importance. Crisis stories should be chosen keeping in mind that (1) a variety of diverse stories will better illustrate the need for broad whistleblower protection laws, and (2) the greater the variety of stories, the easier it will be to gather a broad based coalition in support of whistleblower legislation. May be able to provide the names of unions, national as well as local, besides the ones already list below. The ABA has an official policy in support of whistleblower protection legis-lation and has provided support for federal legislative efforts in the past. They do not provide direct support for state legislative matters, since state legislation is the state bar associations' domain. Mr. Evans or Ms. Pfautz have offered to provide the names and numbers of the appropriate contacts at state bar associations. Government watchdog and environmental protection group. Although Citizen Action has not taken an official national position on whistleblower protection, they are generally supportive, and some of their state affiliates have taken position on state legislation. GAP's knowledge and expertise were invaluable in the preparation of this legislative kit. GAP has litigated a number of whistleblower protection cases, has worked on a number of federal whistleblower bills, and regularly provides testimony to the federal government on the need for whistleblower protection. Dr. Soeken serves as a counselor for whistleblowers and has served as an expert witness in court as well as in legislative committee hearings. He is also aware of a variety of resources across the nation for whistleblowers. The WORC helps co-ordinates the activities of resource councils in Colorado, Idaho, Montana, North Dakota, South Dakota, and Wyoming. These councils have worked on a variety of environmental and agricultural issues. The WORC can serve as a resource for contacting the state resource council in the listed states as well as similar organizations in other states. See AMERICAN CIVIL LIBERTIES UNION, POLICY GUIDE (1986 revised aS of October 1992) (specifically policies 55 and 117). Wall Street Journal, April 13,1981, at 18, col 3 and New York Times, February 27, 1983, at 1, Col. 1. See Whistleblowers: Friend or Foe? INDUSTRY WEEK 50 (October 5, 1981). See the "Question and Answer" and "Guide to the Model Act" sections. 391 U.S. 563 (1968). In Givhan v. Western Line Consol. School Dis., 439 U.S. 410, 415-16 (1979), the court interpreted Pickering to protect "the public employee who arranges to communicate privately with his employer rather than to spread his views before the public." Hence, the Constitution affords protections to both internal and external whistleblowers. See DANIEL. P. WESTMAN, WHISTLEBLOWING THE LAW OF RETALIATORY DISCHARGE 149-166 (1991). 42 U.S.C. 1983 (1988) (state and local employees who can show that state law does not adequately protect their Constitutional rights may seek protection under federal law). See WAYNE N. OUTTEN, THE RIGHTS OF EMPLOYEES AND UNION MEMBERS 1-39 (1994). See the "Statutory protections" subsection. See M. Malin, Protecting the Whistleblower from Retaliatory Discharge, 16 U. MICH. J.L REF. 278-288(1983). See eg. McNully v. Bordern, Inc., 475 F. Supp. 1111 (E.D. Pa 1979), and Tameny v. Atlantic Richfield Co., 27 Cal. 3d 167, 610 P. 2d 1330, 164 Cal Rptr. 839 (1980). Alder v. American Standard, 291 M.D. 31, 432 A.2d 464 (1981). 246 S.E. 2d 270 (W. Va 1978). Davenport Good Samaritan Center, 1978-2 Lab. Arb. Awards (CCH) 8441 (Ross, Arb.). 63 Lab. Arb. BNA) 412 (1974) (Gentle, Arb.). See the "State Statutes" subsection. 5 U.S.C. $ 7501-7504 and $ 7511-7514 (1988). Oversight of the Corporate Whistleblower Protection Act of 1989: Hearing Before the Subcommittee on Labor-Management Relations of the House Committee on Education and Labor, 102nd Cong., 2nd Sess. (1992) (testimony of'Thomas Devine, Legal Director, Government Accountability Project). Washington Post, Oct. 19, 1993, at A21. 42 US.C.  2000c et seq. (1988) (anti-retaliation provision at  2000e-3(a). 29 U.S.C.  621 et seq. (1988) (anti-retaliation provision at 29 U.S.C  623(d) (1976). See Tidwell v. American Oil Co., 332 F. Supp. 424 (D. Utah 1971). Berg v. Ice Crosse Coller Co., 612 F.2d 1041 (7th Cir. 1980). See Pettway v. American Cast Iron Pipe Co., 411 F.2d 998 (5th Cir. ), reh'g denied, 415 F.2d 1376 (5th Cir). Pub. L No. 103-3 (FMLA  101 et seq.). 29 U.S.C.  151 et seq. (1976). 29 U.S.C.  215(a)(3) (1988). 29 U.S.C.  651 et seq. (1988) (anti-retaliation provision at  770). Other federal acts which contain anti-retaliation provisions include the Asbestos Hazard Emergency Response Act of 1986,15U.S.C.  2641 et seq. (1988) (anti-retaliation provision at  2651); Asbestos School Hazard Detection Act of 1980, 20 U.S.C.  3601 et seq. (1988) (anti-retaliation provision at  7622); Comprehensive Environmental Response, Compensation, and Liability Act of 1980, 42 U.S.C.  9601 et seq (1988) (anti-retaliation provision at  9610); Department of Defense Authorization Act 1984, 10 U.S.C.  1587 (1988); Department of Defense Authorization Act of 1987, 10 U.S.C.  2409 (1988); Employee Retirement Income Security Act 29 U.S.C.  1001 et seq (1988) (anti-retaliation provision at 1140); Energy Reorganization Act of 1974 42 U.S.C.  5801 et.seq. (1988) (anti-retaliation provision ac  5851); False Claims Act, 31 U.S.C.  3730(h) (1994); Federal Employers' Liability Act. U.S.C.  51 et seq. (1988) (anti-retaliation provision at  60); Federal Mine Safety & Health Act, 30 U.S.C.  801 et seq. (1988) (anti-retaliation provision at  815); Federal Water Pollution Control Act of 1972, 33 U.S.C.  1251 et seq, (1988) (anti-retaliation provision at  1367); Hazardous Substance Release Act. 42, U.S.C.  9610 et seq. (1988) (anti-retaliation provision at  9610); International Safe Containers Act, 46 U.S.C.  1501 et seq. (1988) (anti-retaliation provision at  1506); Jurors Employment Protection Act, 28 UJS.C.  1861 et seq. (1988) (anti-retaliation provision at  1975); Longshoremen's & Harbor Workers' Compensation Act. 33 U.S.C.  901 et seq (1988) (anti-retaliation provision at  948a); Migrant Seasonal and Agricultural Worker Protection Act 29 U.S.C.  1801 et seq. (1988) (anti-retaliation provision at 1855); Public Health Service Act, 42 U.S.C. › 1201 et seq. (1988) (anti--retaliation provision at $ 300a-7); Railroad Safety Authorization Act of 1978. 45 US.C.  421 et seq: (1988) (anti-retaliation provision at  441(1)); Safe Drinking Water Act, 42 US.C.  300f et seq. (1988) (Anti-retaliation provision at  300j-9); Solid Waste Disposal Act, 42 U.S.C.  6901 et seq. (1988) (anti-retaliation provision at  6971); Surface Mining Control & Reclamation Act, 30 U.S.C. $ 1201 et seq. (1988) (anti-retaliation provisions at  1293); Surface Transportation and Assistance Act of 1978, 49 U.S.C.  2301 et seq (1988) (anti-retaliation provision at  2305); and Toxic Substances Control Act, 15 U.S.C.  2601 et sef (1988) (anti-retaliation provision  2622). Information on state statutes can be accessed from the Bureau of National Affairs Labor Relations Reporter (9a IERC). See "Current Legal Status" section. Quite often private sector whistleblowers are forced to depend on the common law public policy exception. However, as discussed in the "Current Legal Status" section, the public policy exception is far too narrow to provide comprehensive whistle-blower protection. THE NEW YORK COMMITTEE FOR OCCUPATIONAL SAFETY AND HEALTH, TOP OSHA VIOLATION: NEW YORK CITY, LONG ISLAND, AND LOWER NEW YORK STATE 3 (May 11, 1993). J. MCMANUS OF THE WISCONSIN COMMITTEE ON OCCUPATIONAL SAFETY AND HEALTH, THE DEADLY DILEMMA: WHEN OSHA FAILS TO PROTECT THE WORKER'S RIGHT TO A WORKPLACE FREE OF HEALTH AND SAFETY HAZARDS 14 (October 15, 1987). "Good faith is an intangible and abstract quality with no technical meaning or statutory definition, and it encompasses, among other things, an honest belief, the absence of malice and the absence of sign to defraud or to seek an uncon-scionable advantage, and an individual's personal good faith is [the] concept of his own mind and inner spirit and, therefore, any not conclusively be determined by his protestations alone." Black's Law Dictionary 623 (5th ad. 1979). A reasonability requirement for whistleblowing was left out of the model statute due to the difficulty involved in defining "reasonable" and due to the difficulty of preventing the misuse of such a requirement. The model's procedure is by no means a radical departure from common statutory complaint procedures. Although certain changes have been made, the model statute's procedure is based on the E.E.O.C. 's filing procedure. The alternative burden of proof arrangement was taken from the Whistleblower Protection Act of 1989. Hearing on H. R 1669, Corporate Whistleblower Protection: Hearing Before The House Subcommittee on Labor Management Relations of the Committee on Education and Labor, 102nd Cong., 2nd Sess. (1992) (testimony of Bruce Montville, President, Exeter International, and Vice-President, National Personnel Associates).